We have a new POS System available and hopefully it’ll fit well in grocery stores or delis. Maybe even a hardware store if you sell things by weight. 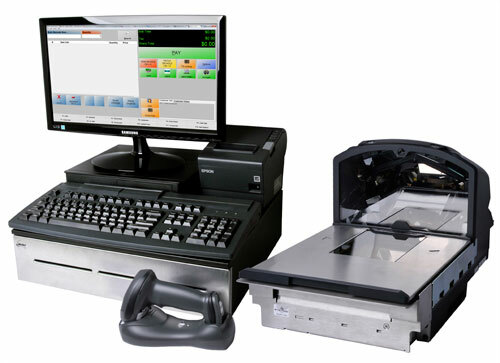 This is the Grocery POS System, another of our pre-configured POS Systems. The system was created because many customers have called in asking for a pre-made grocery system, but we didn’t have one available. Our tech team have been known to setup a retail system to support a scale, but we really wanted something online with all the requisite parts together. We’ve built the Grocery POS System to meet the needs of high volume retailers who sell products both by barcode and weight. The system comes complete with POS Computer, Monitor, Programmable Keyboard, Scanner / Scale, Cordless Scanner, Receipt Printer, and Cash Drawer. That’s a lot of stuff. The POS-X EVO PC4 Pro computer included in the system has the power to handle even massive inventory databases with ease. Powered by an Intel Core i3 processor and 4 GB of RAM, the computer makes short work of product lookups and inventory checks. You also get a full complement of interface ports on the back of the EVO PC4, ensuring the plethora of peripherals can make purchase in the system. Preh’s MCI3100 keyboard consolidates 10-key functionality, credit card reading, and programmable key entry into a remarkably durable housing. We have reviewed this keyboard on video, hanging about 20 pounds of weight from either side while entering data successfully. 23 additional programmable keys are fantastic for putting in unmarked or often scanned products, like fruits or gum or something. In-counter scanner / scale combos are tanks. There’s a reason you still see PSC Magellans deployed even though they were bought by Datalogic and rebranded like 5 years ago. We’re running with the Honeywell Stratos 2400 in our POS system, mostly because we have had pretty great success in installations with this specific model. It has a 30 pound weight limit, so unless you’re selling lead bricks you should be fine. The two omnidirectional laser scanners are incredibly fast, so even if you’re throwing products across they’ll get scanned. You can’t always use the scanner/scale for products you sell. Like dog food, or big boxes of soda that your customer doesn’t want to pull out from under the cart. So for those hulking monstrosities, you have the toughest cordless scanner we’ve ever seen- the Motorola LI4278. We drove over one of these barcode scanners with a BMW station wagon and it still works fine. It also has a 3 foot scan range on retail barcodes, so you don’t really have to stretch to get a good read either. Epson’s TM-T88V prints out receipts at a blisteringly fast pace, so even if a customer just bought like… 400 dollars worth of groceries, the printout will not be a hold up. A 12 inch per second print speed is terrific for long receipts. In terms of durability, the printer’s mean time between failure is 360,000, or about 41 years of use. The high security MMF Advantage Cash Drawer is going to keep your money safe all day long. Along with standard features like sturdy bill weights and multiple under-till media slots, the Advantage features a locked compartment connected to one of said media slots, ensuring things such as checks and large bills can be stored without fear of them walking away. The Advantage also sports a 4 million cycle solenoid lifespan, running smoothly for countless years. We have had a lot of success setting up PCAmerica’s Cash Register Express for use with scales, and the powerful software handles even massive inventory databases. The easy-to-use software uses SQL Express for the database, scaling well to bigger operations and allowing for easy multi-lane setups. All together, these parts make for a powerful means to handle the high volumes grocery checkstands experience. If you have a grocery store and see growth in your future, our Grocery POS System is a great first step. POSGuys.com has partnered with Mercury Payment Systems and Retail Capital to provide new retailers and restaurant owners with Pre-Financed POS Systems. Looking to cut down the initial investment for new businesses, the Pre-Financed POS System defers the cost of hardware with credit card batch fees. Businesses that apply for credit card processing through Mercury Payment Systems are eligible for the Pre-Financed POS System. With a 24-48 hour turnaround and 90% approval rate, getting approved is remarkably straightforward and easy. To ensure quick setup, customers’ point of sale databases are preinstalled before shipment and on-site installation by a certified technician is included, further speeding the setup process. POSGuys also provides over-the-phone training to teach employees and managers the day-to-day functions of their POS software. The Pre-Financed POS System is paid via 10% of daily credit card batches through Mercury Payment Systems. There are no minimum payments or monthly bills, eliminating the headache that can be associated with other financing firms. By paying a set percentage of credit card batches, businesses can scale payments as they grow. The Pre-Financed Retail POS System uses the same hardware as the POSGuys.com Preferred Retail System. Running on the PCAmerica Cash Register Express POS software platform, this retail system scales well from single-checkout retailers to multi-lane operations. POSGuys.com prebuilds the Pre-Financed Retail POS System to ensure the quickest path to ringing up customers. Using the same configuration as the POSGuys.com Premium Restaurant System, the Pre-Financed Restaurant POS System leverages Aldelo Pro For Restaurants software to make order entry and table management straightforward. Ideal for sit-down dining, the system includes a standard order station and kitchen printer, ensuring meal accuracy and customer satisfaction. The Pre-Financed Restaurant POS System is preconfigured and ready to go out of the box. Bellingham, WA, October 4, 2012 – POSGuys.com, provider of complete POS solutions, announced the launch of tableside ordering for restaurant POS systems. These systems enable waitstaff to send orders from anywhere in the restaurant, cutting customers’ wait time for their meal and eliminating order entry errors. The tableside ordering system leverages the power of Aldelo Pro For Restaurants POS Software, integrating with existing Aldelo restaurant solutions. Unlike Aldelo Wireless POS Software, which requires investment in a server PC and mobile computer, the tableside ordering system uses a tablet PC running Windows XP software, capable of running a full license of Aldelo Pro for Restaurants. Employees will have the same experience with the tableside ordering system as they do with a standard POS system or order station. Included in the system are the Partner Tech EM-220 tablet PC, integrated credit card reader, Star Micronics SM-T300 mobile receipt printer, and Aldelo Pro for Restaurants license. The EM-220 tablet PC runs Windows XP, giving you the full functionality of a POS system running Aldelo Pro for Restaurants software. POSGuys.com developed the Tableside Ordering System to fill a growing need for full-service dining establishments. Often, wait staff visit multiple tables before entering order information; with a Tableside Ordering System, orders can be entered on-the-fly. The tablet connects to a restaurant’s Aldelo POS system through their wireless network, providing real-time ordering, as well as any updates such as menu item availability. With the integrated card reader and mobile receipt printer, payment can be taken at tableside, preventing the card from leaving the customer’s field of view and providing a framework for greater PCI compliance. All of this adds up to a terrific solution for restaurants wanting to maximize throughput and security. POSGuys.com is an industry leading point of sale solutions provider, selling complete POS systems, barcode scanners, and receipt printers. Established in 2004, POSGuys.com’s expertly trained sales and support staff create custom point of sale and data capture solutions for businesses nationwide. I bet you can sense the start of a trend with the low-cost security system and this new low-cost retail pos system. Times are tight, and so a $5,000 point of sale system just doesn’t have the same shiny allure as it used to. And so here begins the Starter POS System, at a more affordable $1,599. Don’t let the low cost fool you, though. While other companies list an inexpensive system, only to forget parts like the PC, we make sure you get everything you need. Just scaled back a bit. So you get the PC, you get the barcode scanner, you get the receipt printer, you get the cash drawer, you get it all. I really wanted to sound like Vince from the shamwow ads there. I hope I did. That thing sells itself. We’re able to trim down the price by shipping the systems with Ubuntu Linux and an in-house variation on pos software. But after a few months really mashing around on the system and trying to break it, we were left with a system that is a great first step into computer-based sales tracking. 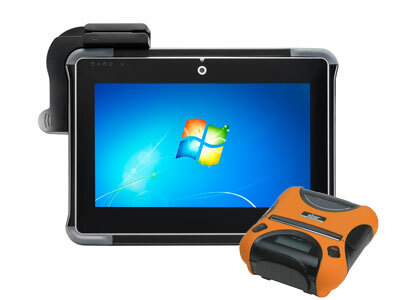 The barcode scanner in the system is the POS-X Xi1000, a solid choice for low volume scanning. Learning the scanning sweet spot is a little rougher than most scanners, but once you get it, scanning UPC barcodes should be no sweat. There is an upgrade to a laser scanner only available from us, which should get blog love later today or tomorrow or whenever I’m feeling wordy. For receipt printers, we went with an impact printer lacking auto-cutter, the POS-X Xr210. It’s a little loud, but it’ll print receipts just fine and you can’t heat the letters off the receipts. Again, upgrades can get you the POS-X Xr510 instead, which is a faster, quieter, thermal receipt printer. The cash drawer is the POS-X XC16HD, which we’ve already shown to be pretty tough. Upgrading that guy seems unnecessary when you can stand on it. More products should have a “can I stand on it” rating. As with all the other systems we sell, you get pretty solid support, including a year of coverage for faulty hardware, training, and having our tech support guys at your beck and call, so long as it’s between 7 am and 4 pm pacific.